What we are is a cold brew bottling company, and moreover, an ever-evolving cold brew company. It seems to us that the best way to share our cold brew with the most people is to complement other coffee shops and grocery stores with our one niche product, and let them take care of the rest. Our latest evolution is our switch from 12 oz to 8 oz bottles, which seems to be going over well. We will continue our lease of the space for now, using it as our headquarters, office, and storage, and also continue to host occasional events, like poetry readings, rock shows, art shows, comedy, pop-ups, brunches, classes, etc. To make more use of the space, we are excited to share it with local photographers Anna Powell Teeter and Ben Rains as a studio and meeting place. The weekend of December 9th and 10th is our next special event on the books. We'll be hosting a vintage clothing pop-up shop, with the same pals we've partnered with before: Mesaware, Orange Crush, and Daddies Fashion. And that same weekend we'll also be having our Uel Zing Holiday Sale / liquidation everything-must-go blow-out of the century—so that's another couple days you can drink our coffee at the source and snag some goodies. ...You can even pick up that pine bench of ours that you've been pining for! Why didn't we just expand our hours? We're a small company with a small budget, and it's not easy to support the staff necessary to run a full-time shop. Plus, throughout this time we've been brewing, bottling, kegging, distributing, etc.—we simply didn't have time to be present at a shop 24/7. Why didn't we just get an espresso machine? Legit espresso machines and the proper accessories are very expensive to acquire and to maintain, our location doesn't have a grease interceptor (long story), and I'm stubbornly obsessed with cold brew as my favorite, most unique method of brewing coffee. Perhaps the main reason: I appreciate the minimalist approach of specialization and doing one thing really really well. Michael Porter, an academic and economist, talks about entrepreneurship and business strategy not as a competition to be the best, but to be the most unique. Business is not a 100 meter dash in a straight line; there are no rules about how to get from A to B, how to grow, how to create, etc. So I don't really think much about competition. 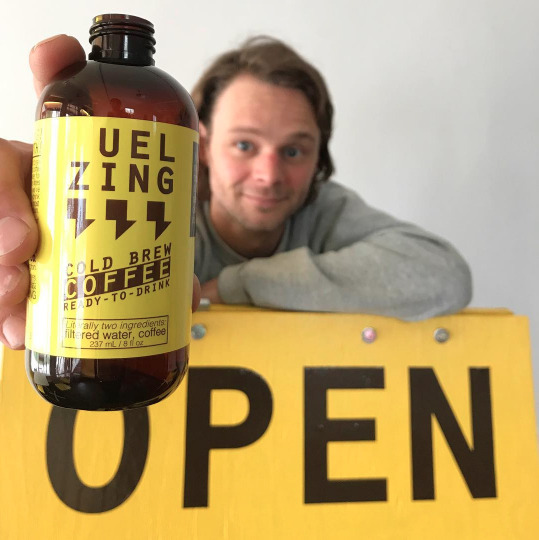 Sure, there are a bunch of new cool coffee shops in Bloomington, and there is a new cold brew bottling company in town, too. Hey, a bustling local coffee scene is a beautiful thing! There are also more and more national cold brew companies at the grocery store. We're just trying to do what is right for Uel Zing; for our team and for our customers, slowly building a company with a unique brand and a product that we're proud of, and that is ultimately sustainable for years to come. Brewing, bottling, and self-distributing takes up plenty of time already, but once we're not glued to the shop, we plan to do more and more marketing at our various outlets, and also use this thing called the Internet. Selling more coffee and other products (like cool shirts and stuff), collaborating with other companies, blogging (hey, I'm blogging right now! ;), making Youtube videos, etc., are all things to do on the Internet. My brother, DIY Pete, is a Youtube star who inspired me to start Uel Zing in the first place, and continues to inspire me in the cool ways that he grows his business online. Computer-based work and the idea of working smarter, not harder are also appealing to me because I have a major life change on the way—Lindsay and I are having a baby! So that is an exciting change for which flexible working hours will definitely help. From the cart to our three different storefronts over the years, we've always had a love/hate relationship with retail—it's great to serve cold brew direct to loving customers, but one product doesn't please everyone, so it's A LOT of just waiting for our few niche customers to come by. With our bottles and kegs, we're able to share our cold brew with folks across the region with a small team and the systems we've built. Unlike a cup of hot coffee that cools off in an hour, cold brew is intentionally cold and stable, so the radius that we can reach is much greater than a neighborhood coffee shop. We might not be saving the world, but we like to think that we're fueling those who are, and at the very least, bring a smile to someone's face. So that's what we call our distribution plan: Smiles for Miles (super cheesey, we know!). Entrepreneurship is a real roller coaster. The only constant is change... and high quality cold brew. Thanks for supporting our business and keep on ZINGin'!